Here fishy, fishy, fishy ! 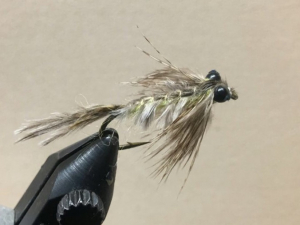 Tying up some “bugs” for hungry steelhead and trout to eat ! The Muskegon river fishing report for February 6, 2019 in the Newaygo, Michigan area is about the yo-yo like weather we’ve had over the past week. The Polar Vortex that came through much of the northern parts of North America, turned those rivers that weren’t yet frozen, into flowing slush for a couple days. With that being followed by a very quick and extreme warm up, many rivers were flowing over their banks due to snow melt after a couple days of 40 and 50 degree weather, along with rain that aided in quick snow melt. Now we’re back to some winter like weather and should be there through mid February. Click HERE for current Muskegon river flow data. There is not much fish catching to report with this update, as I have pretty much shut down guided trips for winter steelhead and/or trout. We simply didn’t get many fall/early winter steelhead in the system and as a result, don’t have many at all that are wintering over in the river. I see that “some” are still promoting such trips, but I can’t………that looks more like a costly boat ride, in questionable weather and you all work too hard for the money you earn. I will “earn” it for a guided trip when conditions improve. Lets state some facts…… steelhead numbers very low, resident Brown and Rainbow trout are extremely lethargic and with water temperatures in the 33-34 degree range, fish AREN’T going to bite much. Click HERE for current and forecasted weather. Over the next month or so of “winter 2019”, I’ll be tying some flies, working on some other equipment and lures, some time at Cannonsburg Ski Area, as well as doing some ice fishing and making snowmen with my boys ! Present water flows on the Muskegon river in the Croton, MI area are around 3,000 cfs, with averages closer to 2,000 and water temperature around 34 degrees.